Thanks for visiting my website, please consider buying a copy of Point North & Pedal, 100% of the profit will go to Cri Du Chat Syndrome. Achieving a life's ambition is hard to describe, I hope my book gives you some idea! Point North and Pedal is now available for Kindle as well as a Paperback! 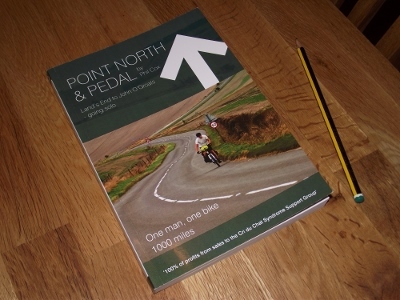 Point North and Pedal is the story of my solo cycle trip from Land's End to John O'Groats - also available on Kindle! Helping others to become interested in fitness and cycling through sharing experience. One bike, one tent, 1,000 miles – what could go wrong? A chance meeting at work first sparked the idea to cycle from Land’s End to John O’Groats, all for charity. I am a keen cyclist who decided to cycle the length of the UK to raise money for the Cri Du Chat Sydrome Support Group and then write about the trip. An account of the 12 day journey is due to be published in April 2013 as a paper back and e-book with 100% of the profit going to the charity. Do MAMILs dream of electronic shifting? Tour de France - Jerseys explained! Kindle Unlimited Trial - How unlimited is Unlimited?